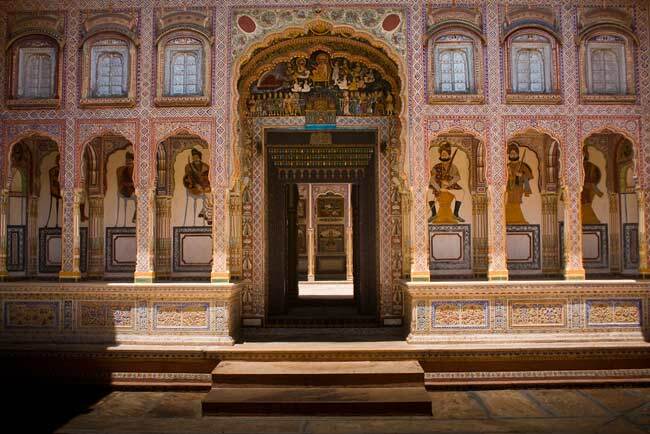 Known as the motherland of many well established marwari business families, Nawalgarh is one of the largest and busiest town in Shekhawati region. Nawalgarh is also famous for its havelis, temples, palaces and Nawalgarh Fort. Founded by Thakur Nawal Singh Ji Bahadur (Shekhawat) in 1737 AD, Nawalgarh is located in the midway between Jhunjhunu and Sikar. Nawalgarh Fort- Thakur Nawal Singh built it in 1737 AD, but now in poorly state and houses two banks and government offices. A small room in fort called ‘Bala Quila’ is famous for its artistic mirrored walls and murals which exhibits cities and armies of Jaipur and Nawalgarhin 1850s. Now owned by a family and entry fee is Rs 10. Roop Niwas Palace- It is built by Thakur Roop Singh Ji and Rawal Madan Singh Ji. This palace is famous for its lush green garden and beautiful fountains. It is now converted to a heritage hotel. Poddar Haveli- Built in 1920 AD, this Anandi Lal Poddar Haveli is the only haveli in Shekhawati which is restored by its owner. Now housing the Dr Rammnath A. Poddar Haveli Museum which contains murals, steam trains, soldiers drilling with rifles and well-dressed local worthies fling kites. It also houses a school, dolls in traditional dress and a artistic display of local fairs and festivals. Other attractions in Nawalgarh are Sheesh mahal, Aath haveli, Morarka haveli, Saraogi haveli and Sheksaria haveli. By Road: Nawalgarh is located midway at 34 km from Sikar and 40 km from Jhunjhunu on Bypass Rd. One can easily reach here by hiring taxi or by RSRTC bus . By Rail: Nawalgarh is well connected through nearest Sikar and Jhunjhunu railway stations to major cities railway stations like Delhi, Agra, Mumbai, Chennai, Ajmer, Pali, Jaipur, Ahmedabad. By Air: Nawalgarh can be reach through nearest Jaipur Airport (156 Km) which is well connected with regular domestic flights to Delhi, Mumbai.